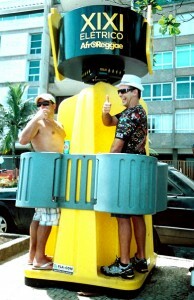 Millions of partiers flock to Rio de Janeiro, Brazil to attend the legendary four-day-long celebration know as Carnival. The entire city shuts down to accommodate revelers living off a fiesta diet of non-stop samba, street foods and beer. Lots of beer. And although it may sound like paradise, it certainly does not smell like one. Unwilling to wait in the long lines for the restrooms, party-goers sought relief on anything and everything, creating a city-wide stench leaving residents pretty pissed off. The situation became so dire that pee patrols were employed to issue fines to those caught urinating in public. Yet, despite these citations and a city-wide awareness campaign, the problem persisted. That was when Afroreggae, a nonprofit promoting positive youth culture in Brazil, teamed up with advertisement agency JWT to create a campaign called “Xixi Electrico,” to turn urine into liquid gold. The campaign installed specially crafted urinals throughout the carnival that harnessed the flow of urine to power the NGO’s music truck. 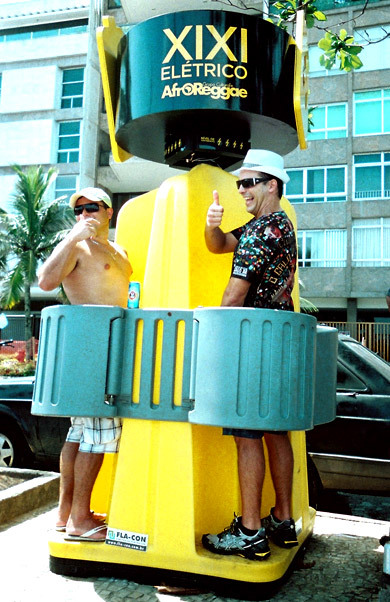 These unique urinals encouraged people to refrain from relieving themselves on the streets. “This way, carnival fans had a real incentive to piss in the right place. The more they did so, the more music the party would have. The NGO turned urine into energy to change behavior,” according to a video on the JWT website. Not only did this inventive campaign alleviate the pee problem, it also served as a model for future eco-friendly and utilitarian solutions.